Published since 1989, E&U is one of the most widely read and distributed journals in its field. Free or discounted subscriptions are available to NGOs and teaching/training institutions in the Global South. 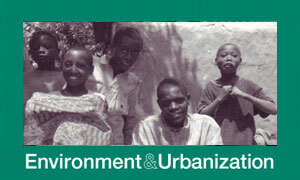 3,100 copies of the most recent issue of Environment and Urbanization were printed. Many subscribers receive just the electronic issue. Six-page summaries of each issue of the journal, prepared primarily for the staff of government departments, city authorities and development assistance agencies) go to 473 persons as printed copy and 1054 persons electronically. Please visit the E&U Briefs page or contact us if you would like to receive these. Summaries of new books, research reports and newsletters, and how these can be obtained (including those in Spanish, French and Portuguese). Please visit the Book Notes page.